We are in the process of relocating from St. Croix to St. Petersburg, Florida. We will be in transit during the months of November and December. We will update this site when we’re settled. We look forward to welcoming you to Florida some some wonderful sailing and instruction in Tampa Bay and the Gulf of Mexico! come aboard for the lighthearted time of your life! Lightheart Sailing offers award-winning private sailing charters and sailing instruction in the Virgin Islands. From a sunset sail to an island-hopping cruising charter, from a quick hands-on lesson to multi-level American Sailing Association certification, Lightheart Sailing custom-designs your private charter to give you the sailing experience of your dreams. Scroll further down to choose your charter, or go straight to our calendar for secure online booking. Lightheart Sailing is based at Green Cay Marina on St. Croix, the most gentle and relaxed of the U.S. Virgin Islands. Our exceptional private sails along St. Croix's coastline are custom-designed for you, and you'll have the yacht and the crew all to yourself. You can take the helm if you like, supported by our captain's expert coaching; or you can just sit back, relax, and enjoy the ride. Come aboard for a lighthearted day of sailing! Choose the length and design of your charter to match your preferences. Our Full-Day Sail gives you a bit of everything. We sail offshore, then to a secluded reef where we anchor for snorkeling plus refreshments. Then you have the choice of more snorkeling or an exhilarating sail along the boardwalk and through the anchorage in Christiansted Harbor. Prices start at $750. Choose the Morning/Afternoon option, and you’ll enjoy a delicious lunch while at anchor. Or choose the Afternoon/Sunset option, and you’ll finish your charter with a sail through the sunset at day’s end. Both options include snacks and beverages as well as snorkeling gear. Prices start at $675. If you prefer a shorter outing, our Half-Day Sail gives you a spirited offshore sail, coupled with either a stop for snorkeling or a romp through Christiansted Harbor. Tasty snacks and beverages are served, and snorkeling gear is included. Choose morning or afternoon. Prices start at $450. What better way to end a day in the tropics than a sunset sail? Leaving the dock in the late afternoon, you'll sail into the sunset, returning at dusk. Our traditional Sunset Sail takes you offshore, then into Christiansted Harbor, sailing past the fort and the boardwalk, through the anchorage, then returning to dock with the last rays of the setting sun. You’ll see St. Croix from a new perspective, and if you’re lucky, you might see the elusive green flash on your return to the dock. Rum punch and light snacks are served. A different kind of sailing experience is yours with our Sunset Meditation Sail, courtesy our sister organization Captains Courageous. Setting an intention of mindful awareness, you'll sail to a secluded anchor spot where a guided meditation will encourage openness to the wisdom of your heart and your senses. Afterwards, you'll enjoy light snacks and non-alcoholic beverages as you reflect on bringing your experience into your daily life. For a vacation like no other, Lightheart Sailing offers island-hopping charters in the U.S. and British Virgin Islands and beyond. You'll experience some of the best sailing in the world, enjoying the comfort and performance of our 40-foot Hanse sloop Lightheart, and the support of an award-winning captain. Your charter will be customized for you. You can let your captain do all the sailing, or you can handle the lines and take the helm as much as you like. You can design your itinerary to have your preferred mix of secluded anchorages and active island resort centers, of meals prepared aboard and island restaurant hotspots. You'll have plenty of time to snorkel, dive, paddle, hike, explore - and even shop. Most charters are 7 days, departing from St. Croix or St. Thomas; but we can customize your trip to any length or destination. Prices start at $5400 for your entire party. Please contact us to start planning your trip. For a learn-to-sail vacation, please see our American Sailing Association courses, below. Lightheart Sailing is associated with the Virgin Island Sailing School. We teach American Sailing Association curricula to equip you with outstanding knowledge, skills and experience. Our lead instructor is Captain Peter Branning, named one of the American Sailing Association's elite "Outstanding Instructors." We are based on St. Croix in the US Virgin Islands, where we teach all of our courses except the 101-103-104 vacation package. We also can come to you, to teach you in your own waters on your own boat, or in a location and on a boat of your choosing. We require a 2-person minimum in our courses. Lessons are in 3-hour blocks for 1-2 people. Our sister organization Captains Courageous LLC is a premier provider of experiential learning adventures that foster self-awareness and personal growth for individuals, families, and business teams and leaders. 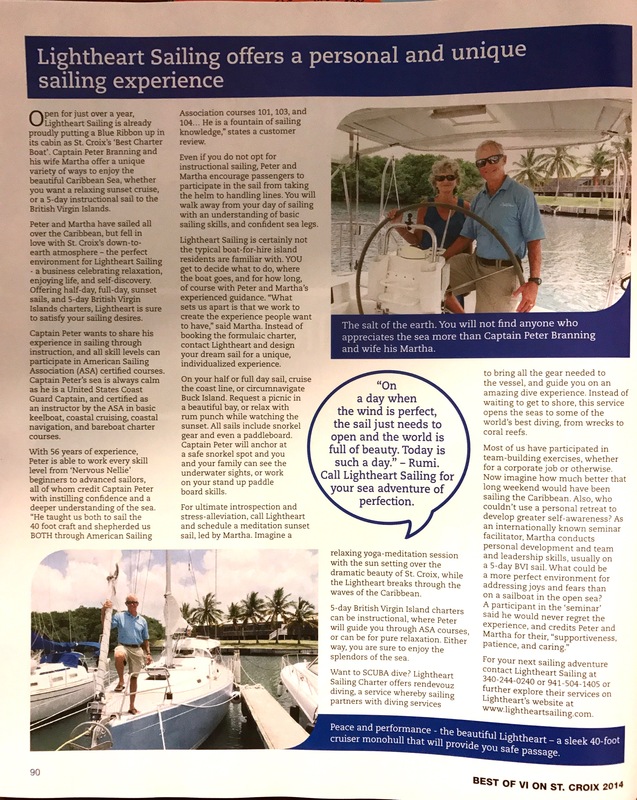 Using unique settings such as sailing voyages, island-based retreats, and virtual get-togethers, Captains Courageous' internationally acclaimed facilitators will help you achieve and maintain higher levels of success and deeper levels of satisfaction. Captains Courageous was founded by Martha Boston, who has been designing and facilitating personal growth and business development experiences across the globe since 1979. "A wonderful experience that will stay with me a lifetime." 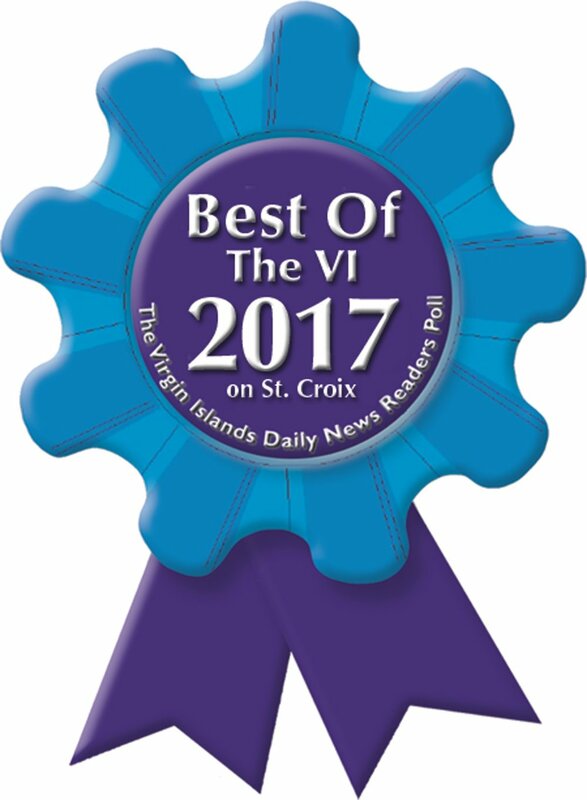 "The highlight of our trip to St Croix." ©2017 Lightheart Sailing. All rights reserved.